4 weeks until Christmas and I know I will stuff myself with bread, Xmas pudding, biscuits actually anything that passes my line of vision will probably end up in my mouth. So, in the run up I try and do a pre-Christmas diet. Nothing fancy but I try and lay off the croissants, bread etc which is hard in France and made even harder as I live above a boulangerie! In a country where the saying is: “A meal without bread is like a day without sunshine“, what on earth do you do if you are wheat intolerant or in fact suffering from coeliac disease. Starve? 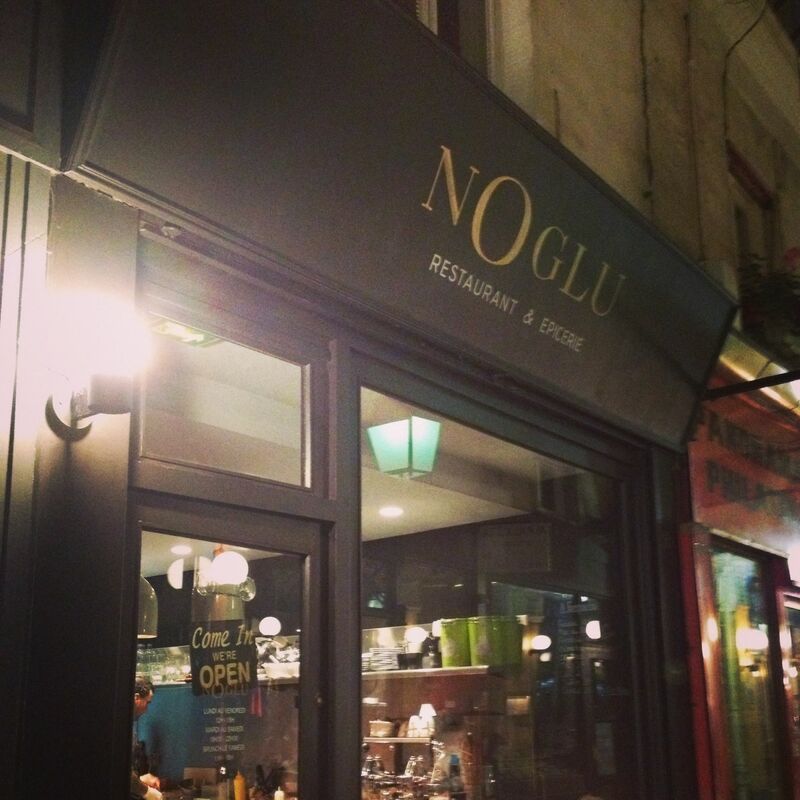 Joking aside, I was about to find out as Paris has a 100% dedicated gluten free restaurant called Noglu. 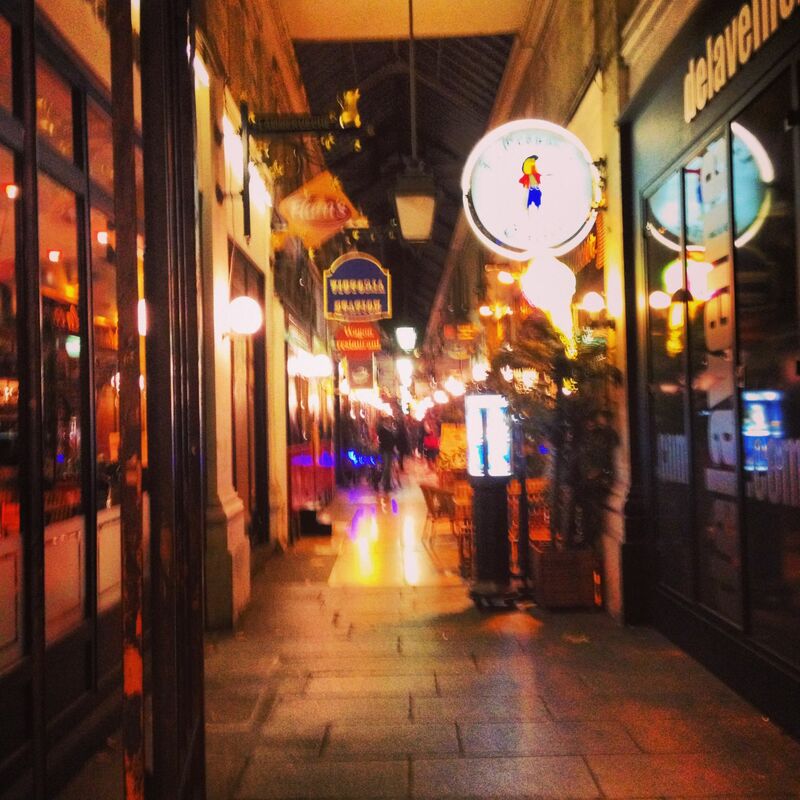 Noglu is located in the wonderfully ancient Passage de Panoramas off the Grand Boulevards. A covered arcade built in 1800 full of curious shops from a bygone era mixed in with a plethora of restaurants; some noteworthy and others to avoid completely. I spent a little while meandering, ok lost, in the passage trying to locate Noglu but I did finally get there albeit at 9.15pm. As I pushed open the door of Noglu I stepped right into the open plan kitchen and bar eating area. The building is long and narrow. The chef said hello and I received a lovely warm greeting from the waitress. I asked if I could have a table for one, no reservation etc. It didn’t seem to phase her although she said the restaurant was full but there was a table finishing up so I should come back in 10 minutes. Back I came and I was seated right away upstairs in the ‘main restaurant’ which is small albeit there was a table of 10 along with 3 other tables and mine in a stripped back, utilitarian feel dining room. There are no individual menus at Noglu as the chef decides on the day what he is going to prepare for the evening after his daily trip to the market. I would, though, have appreciated an individual wine list rather than having to get up and look at the blackboard painted wall. 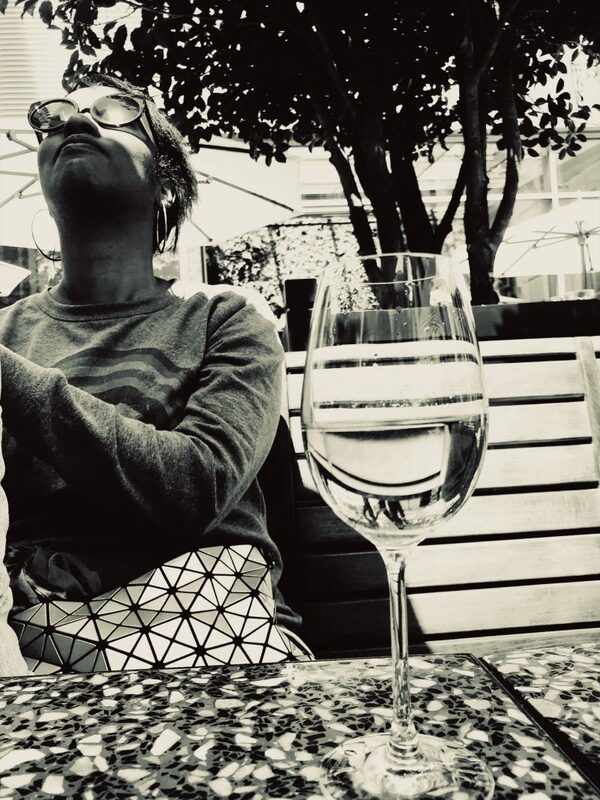 The waitress was not able to remember which wines they had by the glass even though they only have 3 reds and white wines by the glass, but hey! The menu consists of around a few starters and five or so main dishes and then some desserts. As starters there were: sweet potato soup, kale and smoked duck salad, a crab starter. Nothing grabbed my attention and given it was already after 21h I decided I needed to not eat light. The mains were an eclectic mix of sea bass, turkey pizza, vegetarian plate and other dishes. 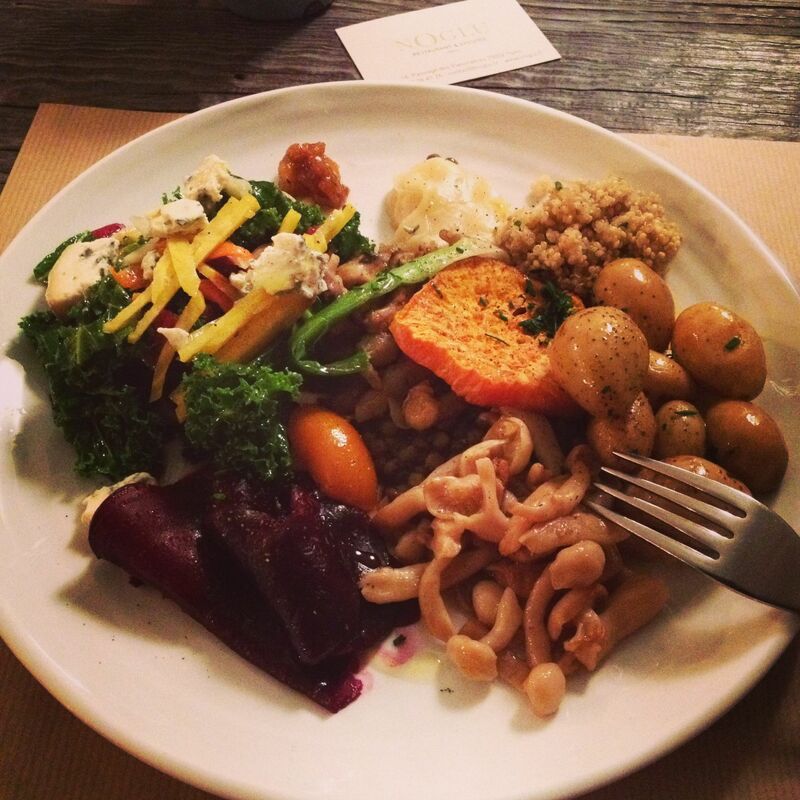 Keeping in mind my pre-Christmas diet I chose the vegetarian plate with its’ promise of kale and mushrooms. Kale is gaining an impressive following in France after the launch of www.thekaleproject.com. I miss eating kale which was easy to find in London so any time I have the chance to eat in France I take it! Whilst waiting for my meal, I noticed the waitresses bringing what looked like gluten free choux puffs to the other tables ‘compliments of the chef’ although he doesn’t extend such compliments to solo diners! I contented myself with my glass of Medoc. What I enjoy about eating out alone is of course the food but more than that is sitting in a relaxed setting. Noglu is not relaxed. I was struck by the cacophony of human voices. 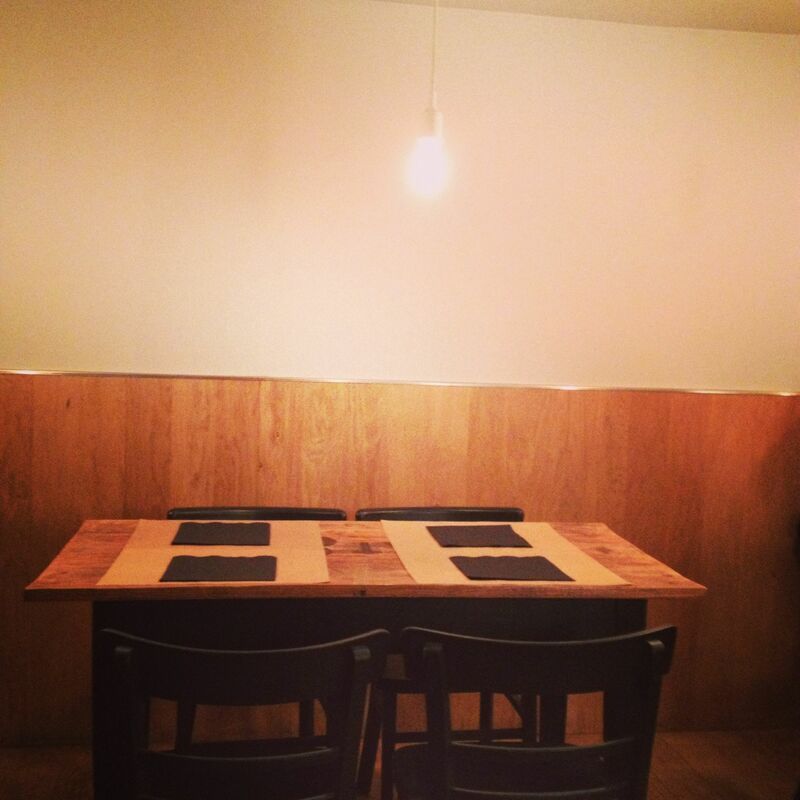 For all the aesthetic pleasure of the dining room, there are no sound buffers so the sound reverberates much as if trapped in a ping pong machine. This is not the place to come for a romantic tête-à-tête or for a quiet catch up with a friend. The other guests were positively shouting at one another. My vegetarian dish provided a flash of colour on a dark winter’s night; kale, peppers, trompette mushrooms, quinoa and new potatoes. Perhaps it was the speed at which I ate or the blue cheese (which overpowered the dish) but by the time I finished the dish I had a little heart burn. I wasn’t interested in the desserts. My head hurt too from all the noise. Eating solo really does have its benefits as you can eat and run which is what I did. I might have enjoyed my meal, and I really wanted too, had the dining room not been so noisy. Restaurants have to realise that the food has to be good but so do the surroundings and if one leaves a restaurant with a headache that is not a good night out or a place worth revisiting. Pricey? My glass of Medoc and vegetarian plate came to €24 if you want to go a la carte like me or, there is the 3 course menu at €35.